The NHL's Redwings and NBA's Pistons have a new home in Detroit at the recently opened Little Caesars Arena in the city's downtown. That isn't the only cityscape Little Caesars Arena is altering though … a reproduction of the sports stadium has just joined Comerica Park, Ford Field and other Detroit landmarks within the Miniland display at LEGOLAND Discovery Center Michigan. Being huge fans of our local sports teams, my kids and I were excited to be invited to the unveiling of this Little Caesars Arena model made entirely from LEGO toys. We had a chance to meet Clint Parry, LEGOLAND Discovery Center Michigan's own Master Builder, who constructed this miniature LEGO reproduction of Little Caesars Arena. To call this a "miniature" model though may be an understatement though as this replica is 6 feet long and consists of more than 30,000 bricks. Parry spent 60 hours designing the model and more than 100 hours building it. Some of the details he shared with us about this LEGO version of Little Caesars Arena is that it has more than 1,000 windows and 600 mini-figures within its layout. You could peek inside to see a hockey game being played on the ice rink during our visit, but Parry told us that this floor plan can be switched out to show mini-figures playing basketball on a hardwood court as well. So both the Red Wings and Pistons can be featured in this model of the home arena they share by switching some pieces in and out. 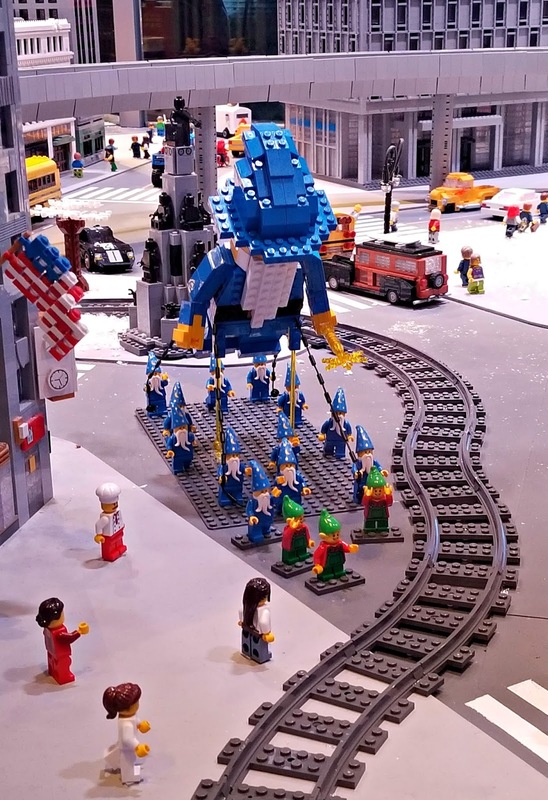 In addition to updating the Miniland with Little Caesars Arena, LEGOLAND Discovery Center Michigan also created a mock parade taking place. The annual Thanksgiving Day parade down historic Woodward Avenue in Detroit has been going on since 1924 and has become known as "America's Thanksgiving Parade." It was a nice touch to have it added to the Miniland display during the holiday season. My son was really impressed with the Merlin balloon that was incorporated into the Miniland's parade. He brought up how much he liked it a number of times during our visit and on the drive home. By the way, Merlin Entertainments, which is the #1 company in Europe for operating entertainment attractions and the world's second largest attraction operator behind Disney, runs LEGOLAND locations so that parade balloon is also an Easter egg for their brand. For the holiday season, Miniland has also received a coating of snow to give it a white Christmas feel. Check out one of my favorite place in Detroit, the Detroit Yacht Club on Belle Isle, covered in snow. I wonder if it will look like that in real life when my wife and I head over there next week for an annual Christmas party we always go to. 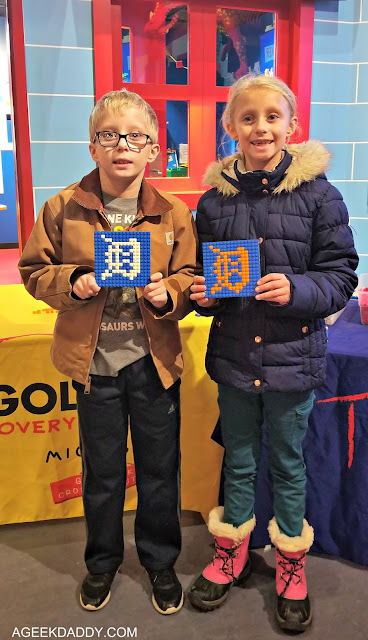 After the unveiling of Little Caesars Arena and walking around the Miniland, the kids spent some time making a LEGO build of their favorite Detroit sports team logo. Of course they picked the Old English D because they always see on the baseball caps I wear. Though I have to say the Detroit Lions logo template other kids were making with LEGO bricks looked really sharp. 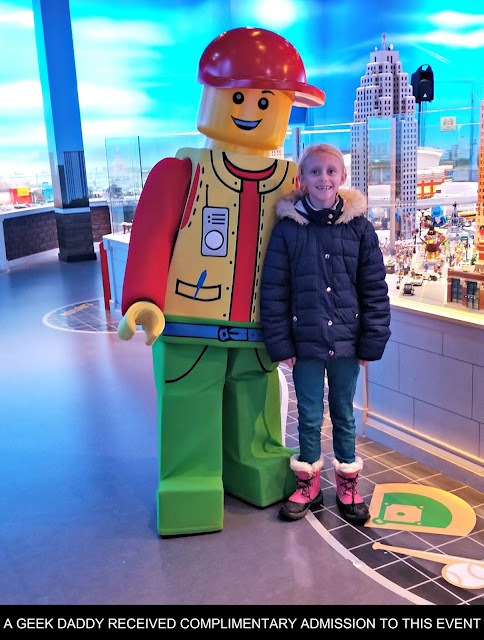 While at LEGOLAND Discovery Center Michigan for the Little Caesar Arena LEGO model unveiling, we also had some time to enjoy the other features that there are to enjoy there. We watched a 4D cinema show about the Legends of Chima, took a spin on the Merlin's Apprentice ride, battled beastly trolls and sneaky skeletons on the Kingdom Quest ride, and built LEGO cars that we raced on a test track. It is always a good time when our family visits LEGOLAND Discovery Center Michigan. LEGOLAND Discovery Center Michigan is located at Great Lakes Crossing Outlets, Michigan's largest indoor outlet mall, in the northern metropolitan Detroit suburban community of Auburn Hills. For more information about this family friendly play spot, head over to michigan.legolanddiscoverycenter.com.